The Poconos in Pennsylvania are some of the prettiest areas in the entire state. I've been fortunate enough to have visited the Poconos several times over the past 10 years and I'm really looking forward to a return trip later this Spring. Recently I received a new travel photography book to review for all of you and I'm excited to tell you more about it today. 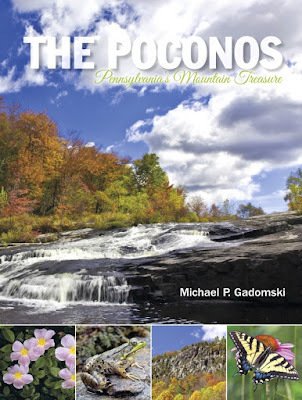 Book Synopsis: Covering parts of six Pennsylvania counties—Monroe, Pike, southern Wayne and Lackawanna, northeastern Carbon, and eastern Luzerne —this book celebrates the Pocono Mountains region: its majestic beauty and history. Nearly 400 images pay homage to the scenic landscape that inspired vacationing families and tourists to escape hot summers in the city for rafting, canoeing, and kayaking while taking advantage of its mountains and plateaus in the winter for some skiing, snowshoeing, and ice-skating. The book also blends the art and culture of the region by showcasing the architecture, attractions, and historical sites of the surrounding counties. There are museums, historical courthouses and homesteads, state parks, nature sanctuaries, waterfalls, foliage, wildlife, and breath-taking vistas. For more than 150 years, visitors have been drawn to vacation and retire in the Poconos. See for yourself one of the most beautiful, interesting, and spectacular places in the United States. My Thoughts: Wow...where do I begin with this one? Well, let me first just say that this is one of the best books that I've ever seen that covers the Poconos mountain region in Pennsylvania. Not only is it comprehensive in the content that it covers but the photographs within this book are gorgeous! This is the type of book you want to leave out on your coffee table, desk top or have it proudly displayed in a special spot on your bookshelf. It's an over-sized, hardcover book by author Michael P. Gadomski that covers everything that a traveler to the area would want to know and would want to see. As a nature lover, I loved looking at the beautiful photographs of the waterfalls, bird life that lives in the area, mountains and fall foliage, old red barns, surrounding farm lands, photos of historic buildings and places, the old fire tower (been there!) and all sorts of other places and things. There is definitely something for everyone in this book! As someone who lives in Pennsylvania and who has visited the Poconos several times, I learned a LOT by reading this book. I found a big list of new places I want to visit and check out when we go back later this spring. Whether you live here or will just be passing through the area, this book is jam-packed with information and gorgeous photographs! You can purchase "The Poconos - Pennsylvania's Mountain Treasure" by author Michael P. Gadomski by visiting Schiffer Publishing online. I'm giving this travel photography book 10 stars out of 10 stars on my rating scale. A great addition to my travel book collection. Disclosure: Shelly was given a complimentary copy of this book to review & feature on her travel blog. No monetary compensation was received. Regardless, Shelly's thoughts, opinions and words are 100% her own. Your thoughts may differ. This is such a beautiful photo book that I would like to see it and then go to then Poconos myself. It seems to contain a lot of different material. I commented on this post yesterday,but don't see it. I love this picture book and it certainly gives me a lot of information about the Poconos.